Home » Inspiration » Good Night Inspirational Quotes – Do not get upset with people or situation! 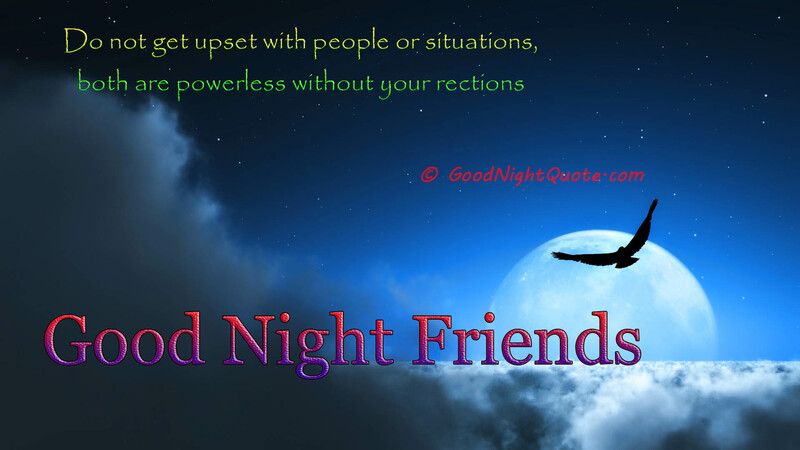 Good Night Inspirational Quotes – Do not get upset with people or situation! Do not get upset with people or situation, both are powerless without your reactions. Don’t do something permanently stupid, just because you are temporarily Upset. Take a breath, It’s just a bad day, Not a bad Life! If you cannot help worrying, remember that worrying cannot help you either. Today is the tomorrow you worried about yesterday. If you worry you die, if you don’t worry you die, so why worry? Defeat may test you; it need not stop you. If at first you don’t succeed, try another way. For every obstacle there is a solution. Nothing in the world can take the place of persistence. The greatest mistake is giving up. Solid advice: If you always tell the truth, you never have to remember anything! The art of simplicity is not about reducing yourself to a smaller size. It’s about clearing the clutter and chaos to make room for your God-given inner greatness to grow and expand. Good Night - Never fear shadows they simply mean there is some light near by. Good Night Inspirational Quotes - Don't stress, Do your best. Forget the rest. Good Night – Quotes on Silence. Good Night Quotes – Keep your dreams in your heart. 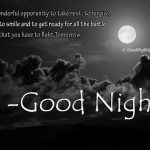 Good Night Inspirational Quotes – Don’t stress, Do your best. Forget the rest. Good Night – Never fear shadows they simply mean there is some light near by. 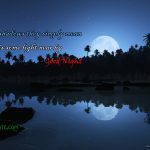 2018 GoodNightQuote.com. All rights reserved.